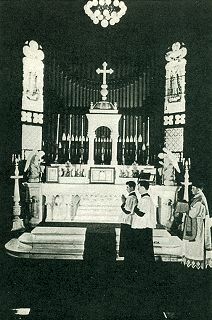 In the Catholic Church, the first object which attracts the eye of the individual is the altar. 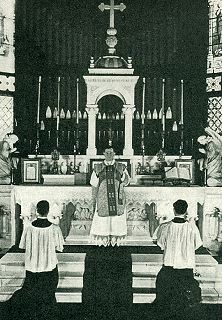 The basic part of any Religion is sacrifice and in the Catholic Church the greatest act of worship is the Sacrifice of the Holy Mass. We are directed by our liturgy today to construct our altars of stone. Imbedded in the stone altar top or mensa should be a little reliquary in which the partial remains of a Christian martyr are preserved. Crosses are placed in the center and on the four corners of the mensa to recall the five wounds of Christ’s body. Since the altar is the place of sacrifice, where, after the consecration of the Holy Mass the particle consecrated becomes the body and blood of our Lord, Jesus Christ, the altar must be dedicated at a special ceremony by the Bishop of the Diocese. 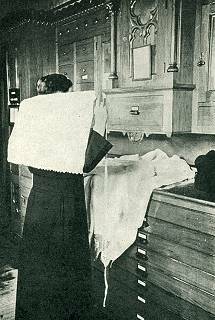 The altar prepared for Holy Mass is covered with three white linen cloths which are provided to absorb the consecrated species of the wine or the precious blood should it be accidentally spilled. 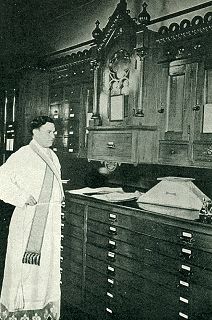 To the right on the altar table is the Mass book called “The Missal.” This book contains not only the common prayers said daily but the seasonal and feast day prayers for the entire year. 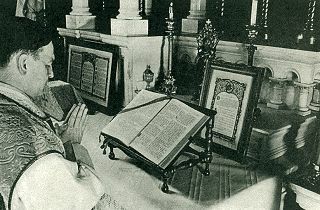 The three altar cards contain some of the common prayers recited by the priest daily at the Holy Mass. 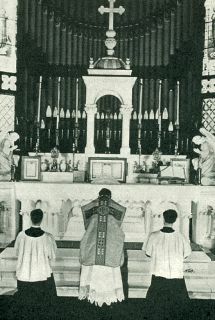 The candles for a Low Mass are two in number. For a High Mass six candles are lighted. These candles are made of beeswax. The vault-like portion in the center of the altar is called the tabernacle or the depository for the Blessed Sacrament. It is richly ornamented. The inside usually is beautifully draped to afford a suitable throne for the King of kings. Above the tabernacle is found a crucifix which recalls to our minds the Sacrifice of Calvary. 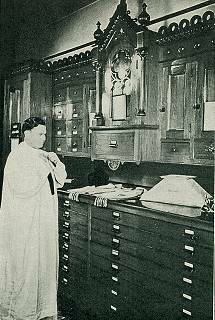 When the priest enters the sacristy the order of the day is studied by him in a little booklet called “The Ordo.” You will observe the vestments on the vestment case with the veiled Chalice. The articles covered by the veil are the Chalice, the Purificator, the Paten, the Host and the Pall. The Chalice and Paten are made of gold because only the most rare and costly utensils should be used at the Holy Sacrifice. They must be consecrated by the Bishop and ordinarily can only be touched by the priest. The Mass is a repetition of the Last Supper, and the Chalice and the Paten are representative of the cup and the dish used by our Lord at the Last Supper. The Paten is the repository for the Host at Offertory and the Chalice contains the wine. 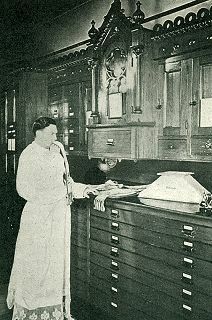 The Purificator is an oblong piece of white linen used to purify the Chalice. You will observe in your study of the Offertory that the celebrant performs this action of purification. 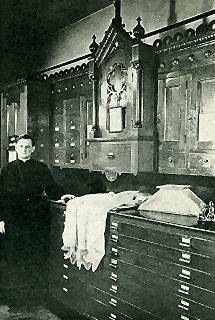 The Stole is the sign of the office of the priest. It is a long slender band usually richly decorated with embroidery or gold. 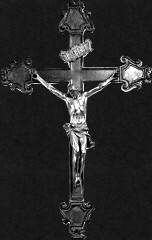 It is placed over the shoulders of the celebrant, crosses upon his breast and secured on either side by the Cincture. The Chasuble takes its name from the Latin “casual” (little house). 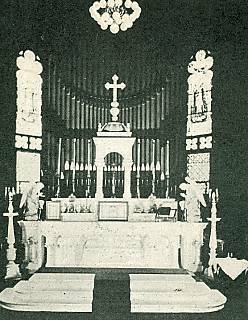 It was used originally as a cover for the priest ready for the celebration of Holy Mass. It varies in color according to the feast as do the Maniple and the Stole. Raise your hearts in pity for your Savior, Who suffered so for you. Be sorry for your sins and pray with the priest raising your hearts to God. The priest is now fully vested and proceeds to the foot of the altar. 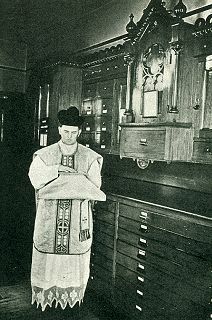 You will observe the headdress worn by the priest. It is called the Birettum. He is robed in his sacred vestments and is accompanied by the acolytes. In his left hand he carries the Chalice covered with the veil. His right hand rests upon the Burse containing the Corporal. He proceeds to the center of the altar, genuflects and proceeds to ascend the steps. Upon reaching the top platform and approaching the altar (Mensa) the priest places the Chalice to the left of the center. 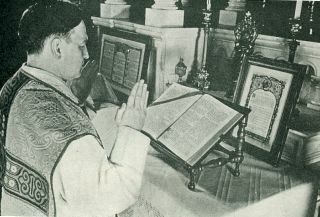 He removes the Burse from the top of the veil-covered Chalice containing the Corporal, opens it and places it immediately over the reliquary and in front of the tabernacle. 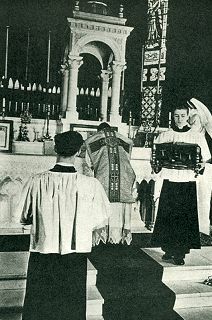 He then places the Chalice on this Corporal, bows reverently and proceeds to the right hand side or the Epistle side of the altar to open and prepare the Missal. 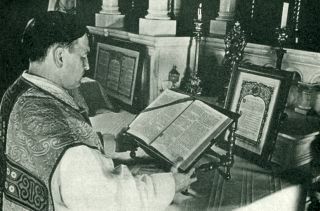 You observe that the book is opened and the various markers are placed for the Mass of the day. He then returns to the center of the altar, bows reverently to the Crucifix and descends to the foot of the altar. 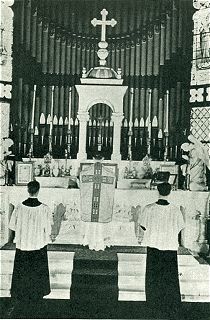 The priest standing at the foot of the altar makes the sign of the cross. The priest asks God for the forgiveness of his own sins and the sins of all present who may be guilty of sin. 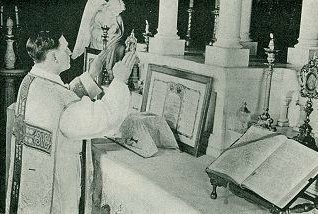 The priest ascends the altar and after reaching the altar he kisses it reverently in respect to the relics contained and proceeds to the Missal. He now reads the Introit. 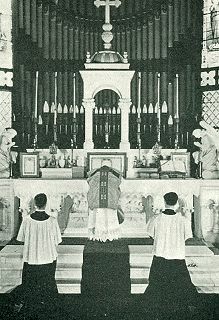 Since all that has gone before has been in the way of preparation for the Holy Sacrifice the Introit should be considered as the real beginning of Holy Mass and it is for this reason that the priest commences this prayer with the sign of the cross. Upon the completion of this prayer he recites the Gloria which begins with the beautiful hymn of praise which the angels chanted on Christmas night when our Lord was born in the stable at Bethlehem. The priest raises his arms and hands reverently towards Heaven during this prayer as a sign of joy. This prayer is omitted in Masses for the Dead. 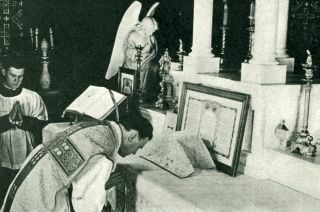 After the Gloria, the priest kisses the altar in reverence for the relics. 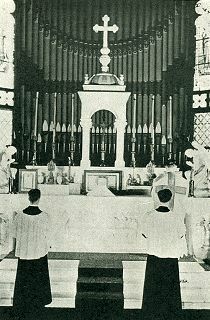 At this ceremony he places both hands upon the altar beyond the Corporal. 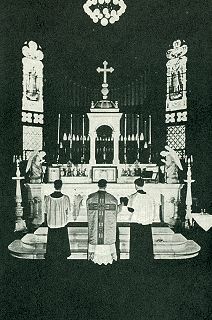 In this action the priest encourages the congregation to take an active part (interiorly) with him in the Holy Sacrifice. This prayer is repeated eight times during the Mass. You will observe that during this prayer the celebrant keeps his hands apart and elevated in penance and to symbolize the unity of prayer of his congregation. This part of the Mass is called the Collects because the people have joined with the priest in asking God for the spiritual faith needed. 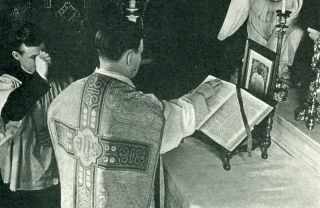 It will also be noticed that the priest holds the Missal as he reads the Epistle and this signifies that we should be doers of the Word and not hearers only. 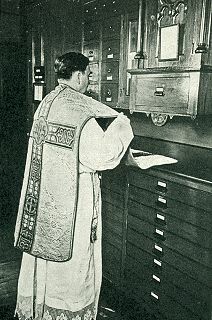 The server removes the book from the Epistle to the Gospel side of the altar. 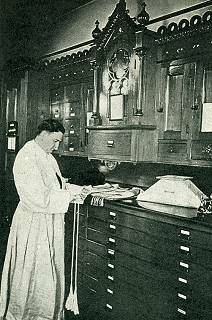 This act is completed by the server as the priest proceeds to the center of the altar where he says the prayer, “Munda Cor Meum,” a prayer in which he asks God to cleanse his heart and make it acceptable to receive the Gospel. Changing the book signifies the fact that the Jews did not accept the teaching of Christ as they should have so both He and His Apostles preached to the Gentiles. 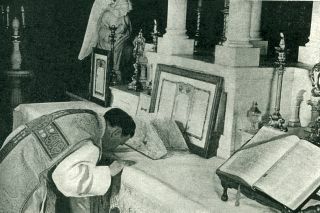 The priest having prayed that God should make him worthy goes to the left side of the altar. 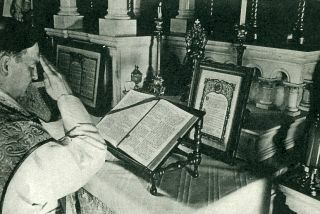 He begins by making the sign of the cross on the book and then on his forehead (that he may know the word of God) and then on his lips (that he may speak the word of God) and then on his breast (that he may love and cherish the word of God). We must all stand to hear the word of the Gospel which is the word of Jesus Christ Himself. We must all sign ourselves as did the priest on the forehead, the lips and the breast. 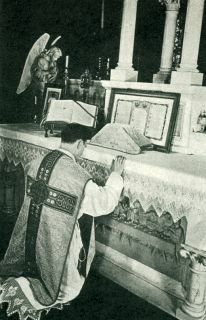 Upon completion of the reading of the Gospel the priest kisses the Gospel portion of the Missal. The people through the servers express their devotion to our Lord by replying. "Prase be to Thee, O Christ!" On Sunday and on certain feast days of the year immediately after the Gospel the priest returns to the center of the altar and recites the Creed, a summary of our Faith. This Creed was made the universal prayer of the Church at the Council of Nice and through the Grace of God and the treasury of Faith it has been handed down through the centuries.